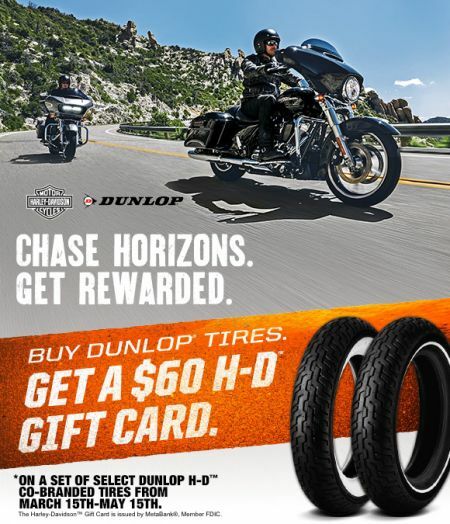 Home › Promotions › LIMITED TIME Spring Dunlop Tire Promotion! LIMITED TIME Spring Dunlop Tire Promotion! Need New Tires for Harley-Davidson®? The weather is getting better, you just looked at your bike and realized it's time for new tires. A quick search for Harley-Davidson® tires near me revealed the cost hasn't gotten any better since last time you bought them. The good news is, we're offering a rebate. When you buy two Dunlop tires, get a $60 rebate. Get in and get your tires before this offer goes away.